Your invoice keeps track of the charges associated with your hosting account(s) since the last billing period. Each new statement will list all charges for new and renewed services since the previous statement. Any payments received since the previous statement are applied against outstanding previous balances, from oldest to newest. An example of a shared invoice is listed below. Invoices may vary based on package type and usage. This section lists the admin billing contact information, like billing address, phone, and email. This section lists specific invoice information, such as the invoice number, the date that the invoice was issued, and the billing account number (BAN) of the account. Your payment method will also be listed. This section lists any previous payments or charges. If you have any previous payments or charges associated with your account, they will show up in this section. Note that this section does not display current charges or payments. Any balances left on the account will be shown here. 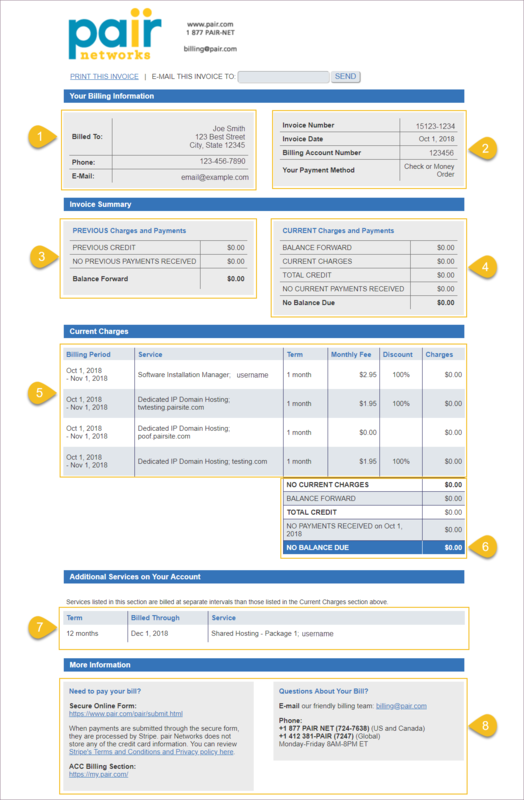 This section lists the totals current charges and payments that pertain to the account. It will also list the total credit and balances found on the account. A total balance will be listed with at the bottom of this section. This section lists the current charges on the account. These can be things like hosting domains, pairSIM installations and more. The billing period will also be displayed for each charge. If a discount is applied, it will be shown here. This section totals up the entirety of the charges listed in section 5. Credit and previous balances will be added here. The total charge will be listed at the bottom. This section will list any additional charges. In the example above, a shared package is listed as an additional charge because it has been already been paid for through to a future month. This may happen if your billing period is not set to monthly. This section lists any extra information you may need. This includes contact information for our billing team, as well as an online payment form, billing terms and conditions, and a link to the ACC Billing section. If you have more questions about our billing invoices, see our FAQ - Invoices article.